A story about the birth of a new China and the political, economic and strategic conflicts between the Kuomintang and the Communists. From the year 1949 to 1954, the Chinese revolution experienced a tidal wave of change which include the peaceful liberation of Beiping (now known as Beijing), negotiations between the Kuomintang and the Communists, the battle of Dujiang, the financial war in Shanghai and several other historical events. 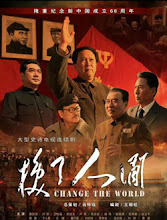 The drama revolves around the establishment of an era under the leadership of Mao Zedong and focuses on the stories of people willing to give their lives for their country. Filming took place in China and Russia. Let us know why you like Change The World in the comments section. Please also share these fun facts using the social media buttons below.